Austin Kent is our guest today. Me too! I want a blind date with Austin Kent! He’s so much better than the disastrous Steve date. Denise asked last week which of her characters we would want to be stranded on a deserted island with. I wholeheartedly chose this man. Maybe it’s because of the above picture. I would hope to not be saved off said deserted island for quite some time as well. The gift that we chose to represent Mr. Kent might be a partial reason why I like him so much. If you can tell us why we chose this Pedrini corkscrew and these very pretty beaded wine glass charms to go along with Austin Kent, you can be entered in the drawing to win them. Unfortunately we cannot also include Austin Kent. What does this gift have to do with Austin Kent? You will have two weeks from today(midnight on July 25th) to comment. At that time we will post the correct answer and the winner. Good Luck! 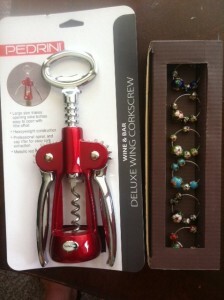 Jeanine- You are the lucky winner of this wine set. I have already emailed you. He is a wine man, knows the whole tasting, swirling, smelling thing that goes on with a good wine. The connection is from the night that Violet tried to set-up Rose with Austin at her house over a barbeque. Austin brought a bottle of red wine for the evening giving Rose her first taste of red wine. He even explained about the wine’s vintage.